When economic news was all depressing? How doomsday was just around the corner? How the dollar was about to take a tumultuous fall? That was a rough time as a financial planner. And it really wasn’t that long ago. The Great Recession was still killing our financial psyche in 2011. That 2008-2009 period had made a lasting impression, and everyone was still pessimistic. All the clickbait media couldn’t stop telling us how awful the economy and markets were. According to them the next shoe would drop any second. But worse than that, we all bought into the pessimism. It’s easy to succumb to the pessimism and that’s the problem. It’s just easy. Pessimism just seeps into you when everything you’re reading is scary. And it was about this time in 2011 that I read a book that helped me change my point of view about the economy. And I want to recommend that book to you. It’s helped me and many financial planning clients getting ready for retirement see the world more effectively for what it is. Not what the media tries to shove down our throats. Now let me introduce you to that book. I’m sure you’re familiar with the Theory of Evolution. Essentially, animals and people evolve over time through survival of the fittest. But Ridley’s position is that ideas, economies and society evolve in the same way—by weeding out the things that don’t work and doubling down on the things that do. Then as a collective being, we humans are the beneficiaries of the best ideas over time. Meanwhile, the ones that aren’t so good (anyone remember Betamax?) get lost along the way. As long as ideas keep improving through this kind of natural selection, Ridley says, we can cast off cataclysmic pessimism. But at the same time, you can definitely take optimism too far. 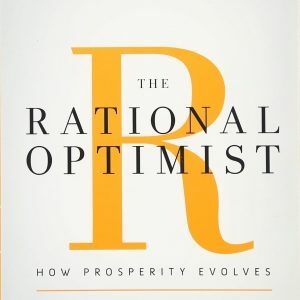 “Rational optimism,” he posits, “holds that the world will pull out of the current crisis because of the way that markets in goods, services and ideas allow human being to exchange and specialize honestly for the betterment of all. “So this is not a book of unthinking praise or condemnation of all markets, but it is an inquiry into how the market process of exchange and specialization is older and fairer than many think and gives a vast reason for optimism about the future of the human race. And that’s just the sort of message I needed in 2011 when it was hard to be any sort of optimist. It’s also something my clients needed. Countless times, clients have come into my office with a dire worldview. They want out of the markets. NOW! This was especially common in the aftermath of the Great Recession. Everything seemed like a losing proposition. One couple in particular I remember coming in around the time I read this book. They were in their late 60s and just freaking out about everything. They’d been reading frightening newsletters predicting the end of the financial world and the dollar’s downfall. They were so alarmed, they even planned to sell their house. They were sure things would never be the same for them again. It became an emotional discussion rather than the practical discussions I should have with clients. I had to slowly talk them down from the economic precipice they stood on. They had prepared themselves to blow up a comfortable lifestyle in a fit of financial suicide! Six years later, these people are still great friends and clients. I saw them the other day. Through 2017, returns have been good. Which leads me to harp on the rational side of rational optimism a little more. Those same clients that almost sold their house are also the type to want to get overly aggressive when things are great. And it kind of makes sense. When you’re retired and all you have are assets, it’s easy to feel like the markets are acting on you and you don’t have any control. So in that regard, I often have to pull people back from being too optimistic. Just like pessimism can mean financial suicide, undue optimism can create the same outcome in reverse. What I’ve found is that feelings of optimism or pessimism snowball. It’s so easy to get caught up in the prevailing sentiments of clickbait media, your social circle or of markets in general. And that’s dangerous whether the sentiment is optimistic or pessimistic. As a financial planner, I provide a rationally optimistic point of view. I always want you to be balanced in the way you view your finances, the economy and markets. Because remember, too much of anything is a bad thing. Even if that thing is optimism. Has too much pessimism or optimism ever hurt you with your financial planning? Tell me about it in the comments below!